If you want to save your money during your travelling, some warnet give cheap cost to use, never try warnet on the tourism place because the cost is more expensive, so it’s recommended that you may look it on the public place like in the downtown. Normally, the price to use internet is about Rp. 3000 to Rp. 5000 per-hour. I have found a warnet in the tourism area which it costs Rp. 9000 per-hour, I think its not good choice if you want to save your money. A type of warnet picture. Why we should choose warnet, if you want to get more faster Internet connection, instead sharing wi-fi that has limited connection on the cafe, you can take warnet for the best, the average of warnet speed is about 320kbps until 1mbps, so its depend on the cost, if you find more expensive but with high-fast connection, its still reasonable. 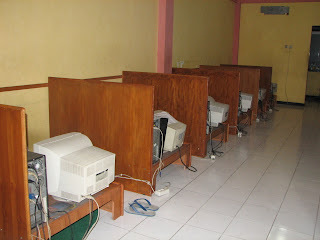 Choose a warnet that has private rooms inside and never play on Warnet that has kids inside who play online game, so you before entering the warnet, make sure its quite and calm. Be careful when you use a PC in Warnet, some greedy people could installed a Keylogger that would reveal your id and password, so… to avoid this, just make sure to check is it installed with updated anti virus or asking the operator if you aren’t sure with the PC. There were some pc’s that I have found, they were infected by bunch of viruses because the operator never care about updating PC system security, if you want to connect your memory card / usb, just think twice to do it. In the end, Warnet is optional choice just in case if you don’t want to bring your laptop during the travelling, it’s easy to find and it’s everywhere.